Click the legend to turn layers on or off. Hover your mouse over the display to reveal data. To zoom in on a shorter time period, click the display, drag mouse to the left or right, then release. Energy from the sun drives the Earth's weather and climate. The Earth absorbs some of the energy it receives from the sun and radiates the rest back toward space. However, certain gases in the atmosphere, called greenhouse gases (GHGs), absorb some of the energy radiated from the Earth and trap it in the atmosphere. These gases essentially act as a blanket, making the Earth’s surface warmer than it otherwise would be. This “greenhouse effect” occurs naturally, making life as we know it possible. Since the Industrial Revolution began in the late 1700s, however, people have added a substantial amount of GHGs into the atmosphere by burning fossil fuels, cutting down forests, and conducting other activities (see the U.S. Greenhouse Gas Emissions indicator). When GHGs are emitted into the atmosphere, many remain there for long time periods ranging from a decade to many millennia. Over time, these gases are removed from the atmosphere by chemical reactions or by emissions sinks, such as the oceans and vegetation, which absorb GHGs from the atmosphere. However, as a result of human activities, these gases are entering the atmosphere more quickly than they are being removed, and thus their concentrations are increasing. Ozone is also a GHG, but it differs from other GHGs in several ways. The effects of ozone depend on its altitude, or where the gas is located vertically in the atmosphere. Most ozone naturally exists in the layer of the atmosphere called the stratosphere, which ranges from approximately 6 to 30 miles above the Earth’s surface. Ozone in the stratosphere has a slight net warming effect on the planet, but it is good for life on Earth because it absorbs harmful ultraviolet radiation from the sun, preventing it from reaching the Earth’s surface. In the troposphere—the layer of the atmosphere near ground level—ozone is an air pollutant that is harmful to breathe, a main ingredient of urban smog, and an important GHG that contributes to climate change. Unlike the other major GHGs, tropospheric ozone only lasts for days to weeks, so levels often vary by location and by season. For more information about stratospheric and tropospheric ozone, respectively, see the Stratospheric Ozone Levels Over North America and Ambient Concentrations of Ozone indicators. This indicator describes concentrations of GHGs in the atmosphere. It focuses on the major GHGs that result from human activities. For carbon dioxide, methane, nitrous oxide, and halogenated gases, recent measurements come from monitoring stations around the world, while measurements of older air come from air bubbles trapped in layers of ice from Antarctica and Greenland. By determining the age of the ice layers and the concentrations of gases trapped inside, scientists can learn what the atmosphere was like thousands of years ago. This indicator also shows data from satellite instruments that measure ozone density in the troposphere, the stratosphere, and the “total column,” or all layers of the atmosphere. These satellite data are routinely compared with ground-based instruments to confirm their accuracy. Ozone data have been averaged worldwide for each year to smooth out the regional and seasonal variations. Global atmospheric concentrations of carbon dioxide, methane, nitrous oxide, and certain manufactured GHGs have all risen significantly over the last few hundred years (Exhibits 1, 2, 3, and 4). Historical measurements show cyclical glacial-interglacial patterns over geological time scales, and they show that the current global atmospheric concentrations of carbon dioxide, methane, and nitrous oxide are unprecedented compared with the past 800,000 years (see Exhibits 1, 2, and 3). Carbon dioxide concentrations have increased steadily since the beginning of the industrial era, rising from an annual average of 280 ppm in the late 1700s to 401 ppm as measured at Mauna Loa in 2015—a 43 percent increase (see Exhibit 1). Almost all of this increase is due to human activities (IPCC, 2013). 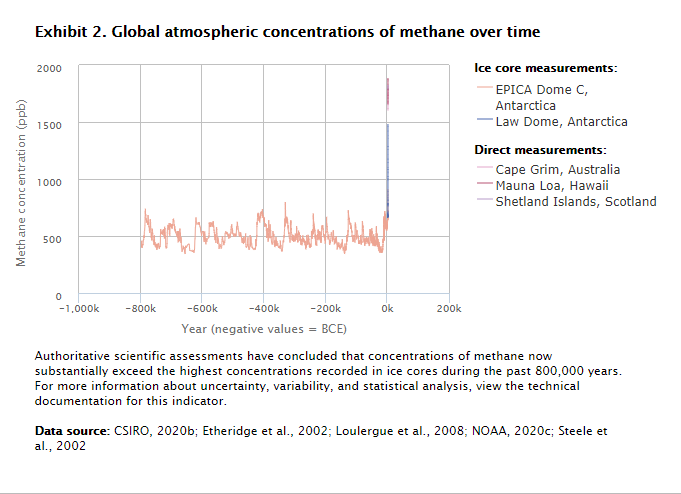 The concentration of methane in the atmosphere has more than doubled since preindustrial times, reaching approximately 1,800 ppb in recent years (see the range of measurements for 2014 and 2015 in Exhibit 2). This increase is predominantly due to agriculture and fossil fuel use (IPCC, 2013). Methane concentration measurements since 1950 demonstrate a pattern of higher values from research sites located in northern latitudes—a result of the higher number of methane sources in the northern hemisphere and methane’s relatively short lifetime compared with other long-lived GHGs. Despite the latitudinal differences, however, the pattern over the past two centuries shows a common trend in all locations. Over the past 800,000 years, concentrations of nitrous oxide in the atmosphere rarely exceeded 280 ppb. Levels have risen since the 1920s, however, reaching a new high of 328 ppb in 2015 (average of three sites in Exhibit 3). This increase is primarily due to agriculture (IPCC, 2013). Concentrations of many of the halogenated gases shown in Exhibit 4 were essentially zero a few decades ago but have increased rapidly as they have been incorporated into industrial products and processes. Some of these chemicals have been or are currently being phased out of use because they are ozone-depleting substances, meaning they also cause harm to the Earth’s protective ozone layer. As a result, concentrations of many major ozone-depleting gases have begun to stabilize or decline. Concentrations of other halogenated gases have continued to rise, however, especially where the gases have emerged as substitutes for ozone-depleting chemicals. Overall, the total amount of ozone in the atmosphere decreased by about 3 percent between 1979 and 2014 (Exhibit 5). All of the decrease happened in the stratosphere, with most of the decrease occurring between 1979 and 1994. Changes in stratospheric ozone reflect the effect of ozone-depleting substances. These chemicals have been released into the air for many years, but recently, international efforts have reduced emissions and phased out their use. Globally, the amount of ozone in the troposphere increased by about 3 percent between 1979 and 2014 (Exhibit 5). This indicator includes several of the most important halogenated gases, but some others are not shown. Many other halogenated gases are also GHGs, but Exhibit 4 is limited to a set of common examples that represent most of the major types of these gases. The indicator does not address certain other pollutants that can affect climate by either reflecting or absorbing energy. For example, sulfate particles can reflect sunlight away from the Earth, while black carbon aerosols (soot) absorb energy. Data for nitrogen trifluoride (Exhibit 4) reflect modeled averages based on measurements made in the Northern Hemisphere and some locations in the Southern Hemisphere, to represent global average concentrations over time. The global averages for ozone only cover the area between 50°N and 50°S latitude (77 percent of the Earth’s surface), because at higher latitudes the lack of sunlight in winter creates data gaps and the angle of incoming sunlight during the rest of the year reduces the accuracy of the satellite measuring technique. This indicator does not include concentrations of water vapor. Although water vapor is the most abundant GHG in the atmosphere, human activities have only a small direct influence on it, primarily through irrigation and deforestation (IPCC, 2013). The surface warming caused by human production of other GHGs, however, leads to an increase in atmospheric water vapor, because warmer temperatures make it easier for water to evaporate and stay in the air in vapor form. This creates a positive “feedback loop” in which warming leads to more warming. 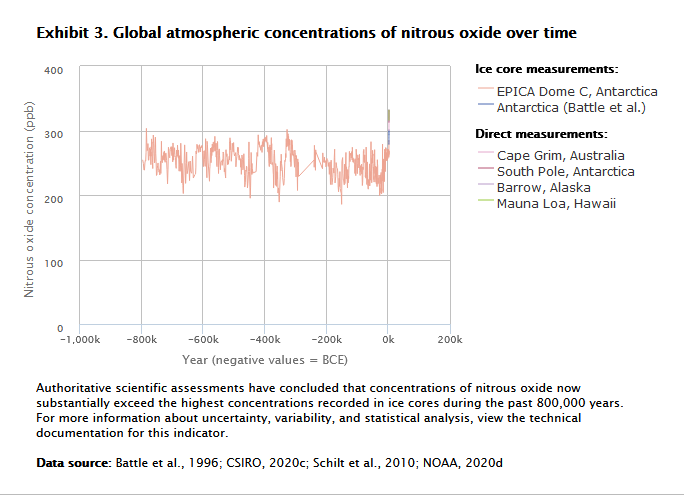 Global atmospheric concentration measurements for carbon dioxide (Exhibit 1), methane (Exhibit 2), and nitrous oxide (Exhibit 3) come from a variety of monitoring programs and studies published in peer-reviewed literature. References for the underlying data are noted below the corresponding exhibits. 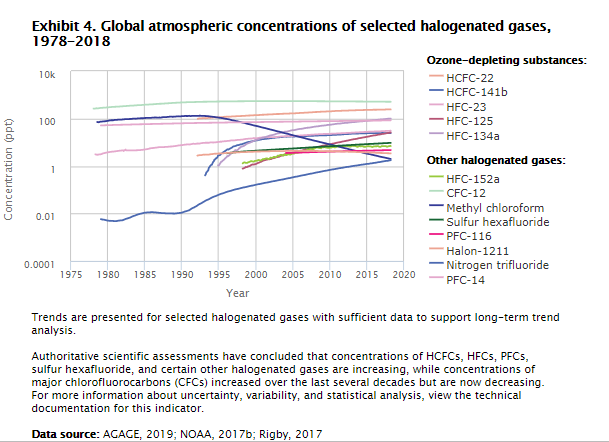 Global atmospheric concentration data for selected halogenated gases (Exhibit 4) were compiled by the National Oceanic and Atmospheric Administration (NOAA, 2016b), the Advanced Global Atmospheric Gases Experiment (AGAGE, 2016), and members of the AGAGE team (Rigby, 2016). A similar figure with many of these gases appears in the Intergovernmental Panel on Climate Change’s Fifth Assessment Report (IPCC, 2013). Satellite measurements of ozone were processed by the National Aeronautics and Space Administration and validated using ground-based measurements collected by the National Oceanic and Atmospheric Administration (NASA, 2013, 2015, 2016). AGAGE (Advanced Global Atmospheric Gases Experiment). 2016. ALE/GAGE/AGAGE data base. Accessed June 2016. http://agage.mit.edu/data. AGAGE. 2015. Monthly mean N2O concentrations for Cape Grim, Australia. Accessed June 5, 2015. http://ds.data.jma.go.jp/gmd/wdcgg/cgi-bin/wdcgg/catalogue.cgi. Battle, M., M. Bender, T. Sowers, P. Tans, J. Butler, J. Elkins, J. Ellis, T. Conway, N. Zhang, P. Lang, and A. Clarke. 1996. Atmospheric gas concentrations over the past century measured in air from firn at the South Pole. Nature 383:231–235. Accessed September 8, 2005. https://urs.earthdata.nasa.gov/home. Etheridge, D.M., L.P. Steele, R.J. Francey, and R.L. Langenfelds. 2002. Historical CH4 records from Antarctic and Greenland ice cores, Antarctic firn data, and archived air samples from Cape Grim, Tasmania. In: Trends: A compendium of data on global change. Oak Ridge, TN: U.S. Department of Energy. Accessed September 13, 2005. http://cdiac.ornl.gov/trends/atm_meth/lawdome_meth.html. Etheridge, D.M., L.P. Steele, R.L. Langenfelds, R.J. Francey, J.M. Barnola, and V.I. Morgan. 1998. Historical CO2 records from the Law Dome DE08, DE08-2, and DSS ice cores. In: Trends: A compendium of data on global change. Oak Ridge, TN: U.S. Department of Energy. Accessed September 14, 2005. http://cdiac.ornl.gov/trends/co2/lawdome.html. IPCC (Intergovernmental Panel on Climate Change). 2013. Climate change 2013: The physical science basis. Working Group I contribution to the IPCC Fifth Assessment Report. Cambridge, UK: Cambridge University Press. http://www.ipcc.ch/report/ar5/wg1/mindex.shtml. Loulergue, L., A. Schilt, R. Spahni, V. Masson-Delmotte, T. Blunier, B. Lemieux, J.-M. Barnola, D. Raynaud, T.F. Stocker, and J. Chappellaz. 2008. Orbital and millennial-scale features of atmospheric CH4 over the past 800,000 years. Nature 453:383–386. www.ncdc.noaa.gov/paleo/pubs/loulergue2008/loulergue2008.html. NASA (National Aeronautics and Space Administration). 2016. SBUV merged ozone dataset (MOD). Version 8.6. Accessed March 2016. http://acdb-ext.gsfc.nasa.gov/Data_services/merged/index.html. NASA. 2015. Tropospheric ozone data from AURA OMI/MLS. Accessed May 2015. http://acdb-ext.gsfc.nasa.gov/Data_services/cloud_slice/new_data.html. NASA. 2013. Data—TOMS/SBUV TOR data products. Accessed November 2013. Subsequently relocated to https://ozoneaq.gsfc.nasa.gov/data/ozone/. NOAA (National Oceanic and Atmospheric Administration). 2016a. Annual mean carbon dioxide concentrations for Mauna Loa, Hawaii. Accessed April 14, 2016. ftp://ftp.cmdl.noaa.gov/products/trends/co2/co2_annmean_mlo.txt. NOAA. 2016b. Halocarbons and Other Atmospheric Trace Species group (HATS). Accessed June 2016. www.esrl.noaa.gov/gmd/hats. NOAA. 2016c. Monthly mean carbon dioxide concentrations for Barrow, Alaska; Cape Matatula, American Samoa; and the South Pole. Accessed April 14, 2016. ftp://ftp.cmdl.noaa.gov/data/trace_gases/co2/in-situ/surface. NOAA. 2016d. Monthly mean CH4 concentrations for Cape Grim, Australia. Accessed July 16, 2016. ftp://ftp.cmdl.noaa.gov/data/trace_gases/ch4/flask/surface/ch4_cgo_surface-flask_1_ccgg_month.txt. NOAA. 2016e. Monthly mean CH4 concentrations for Mauna Loa, Hawaii. Accessed July 16, 2016. ftp://ftp.cmdl.noaa.gov/data/trace_gases/ch4/flask/surface/ch4_mlo_surface-flask_1_ccgg_month.txt. NOAA. 2016f. Monthly mean N2O concentrations for Barrow, Alaska; Mauna Loa, Hawaii; and the South Pole. Accessed June 8, 2016. www.esrl.noaa.gov/gmd/hats/insitu/cats/cats_conc.html. Rigby, M. 2016 update to data originally published in: Arnold, T., C.M. Harth, J. Mühle, A.J. Manning, P.K. Salameh, J. Kim, D.J. Ivy, L.P. Steele, V.V. Petrenko, J.P. Severinghaus, D. Baggenstos, and R.F. Weiss. 2013. Nitrogen trifluoride global emissions estimated from updated atmospheric measurements. P. Natl. Acad. Sci. USA 110(6):2029–2034. Data updated July 2016. Schilt, A., M. Baumgartner, T. Blunier, J. Schwander, R. Spahni, H. Fischer, and T.F. Stocker. 2010. Glacial-interglacial and millennial scale variations in the atmospheric nitrous oxide concentration during the last 800,000 years. Quaternary Sci. Rev. 29:182–192. ftp://ftp.ncdc.noaa.gov/pub/data/paleo/icecore/antarctica/epica_domec/edc-n2o-2010-800k.txt. Steele, L.P., P.B. Krummel, and R.L. Langenfelds. 2007. Atmospheric CO2 concentrations (ppmv) derived from flask air samples collected at Cape Grim, Australia, and Shetland Islands, Scotland. Commonwealth Scientific and Industrial Research Organisation. 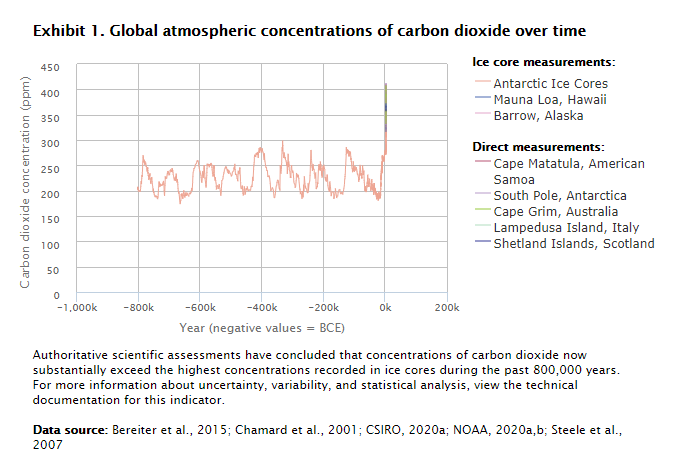 Accessed January 20, 2009. http://cdiac.ornl.gov/ftp/trends/co2/csiro/. Steele, L.P., P.B. Krummel, and R.L. Langenfelds. 2002. Atmospheric CH4 concentrations from sites in the CSIRO Atmospheric Research GASLAB air sampling network (October 2002 version). In: Trends: A compendium of data on global change. Oak Ridge, TN: U.S. Department of Energy. Accessed September 13, 2005. http://cdiac.esd.ornl.gov/trends/atm_meth/csiro/csiro-shetlandch4.html.